n-n-never going to fit them all, but i won't be a lier. I'm never going to wear your shoes, to become your desire. I'm the one I ever do that out. I don't need to fake, 'cause I'm more than a dummy! I never found it funny! I never hurt no one for who they are. I don't need to play Hide and seek with nobody! Just live and let me live! you, you, you, you, you, you! , you, you, you, you, you, you! m-m-maybe we can get along, looking chains for the better. I can tell you I'm not the only one, who has needed a cover. I don't need to be there when you want, want, to be the one, one you give a shock. I don't need to be there when I'm not! I DON'T NEED TO BE YOU! (viva la vida, v-viva la vida) WIRE! 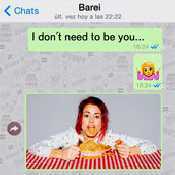 Ampliar Canción I Don't Need to Be You de Barei .